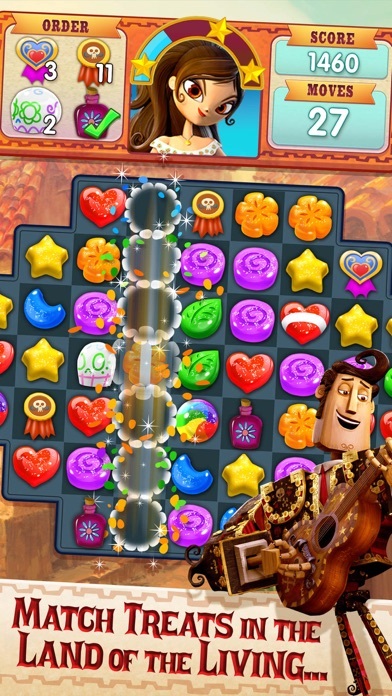 Match sugar candies and rainbow drops to master this fun and challenging match-3 puzzle adventure inspired by THE BOOK OF LIFE! 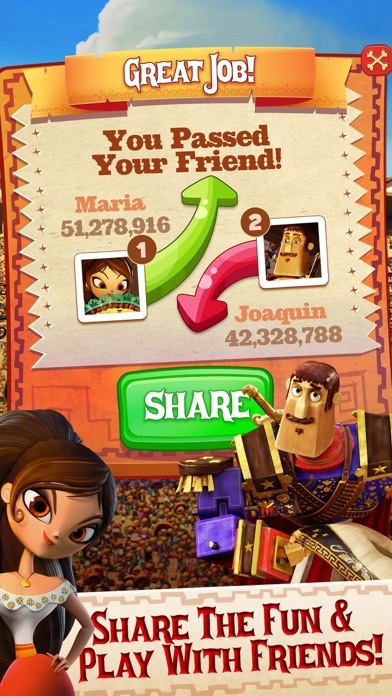 Help Manolo, Maria, and Joaquin collect an assortment of delicious treats and beautiful charms as they prepare for an epic fiesta! Travel through amazing worlds like the colorful Land of the Remembered and the enchanting Land of the Living! Remember, always play from your heart! Features: • Hundreds of exciting levels themed to the animated movie • Featuring the voices of Channing Tatum, Zoe Saldana, Christina Applegate, Diego Luna, Ron Perlman, and Ice Cube! • Sugary sweet churro challenges and fun power-ups, like 'Chuy Charge’ and Piñata Bombs! • Connect to Facebook to send lives and gifts! Share all the fun with your friends! • Free to play with regular updates including new levels, challenges, obstacles and more! • Spend a minute to learn it and a lifetime enjoying it! • Fun New iMessage Stickers! Use them to sweeten up your conversations today! 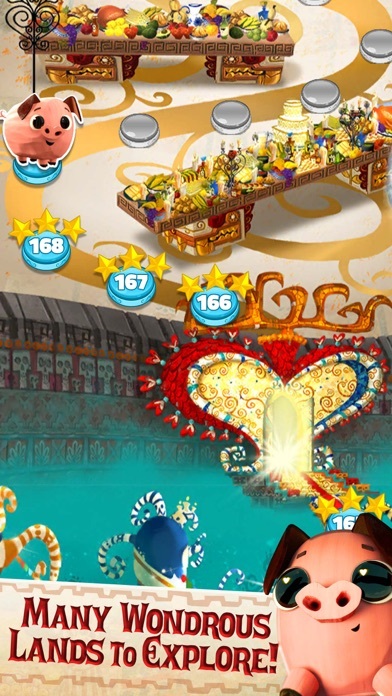 Like on Facebook: https://www.facebook.com/bookoflifegame Follow on Twitter: @BookOfLifeGame Visit our official website: http://www.bookoflifegame.com/ Having trouble? 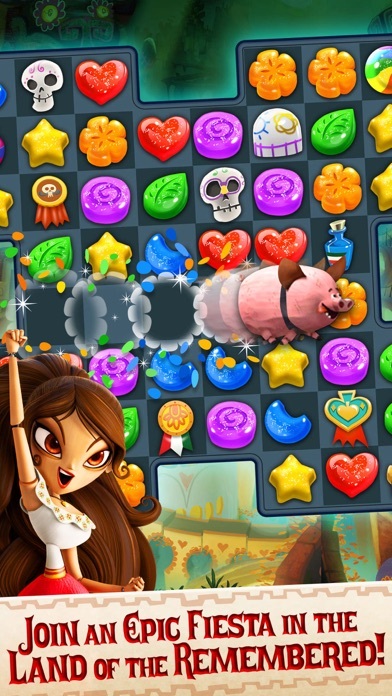 Visit our support page: https://bookoflife.zendesk.com DEVELOPER INFO: Jam City is the leading developer in truly cross-platform social gaming. Chart-topping hits include the successful match-3 puzzle game, Cookie Jam, Panda Pop - Bubble Shooter, Juice Jam, Genies & Gems and so many more! Wherever you are, pick up and play today. 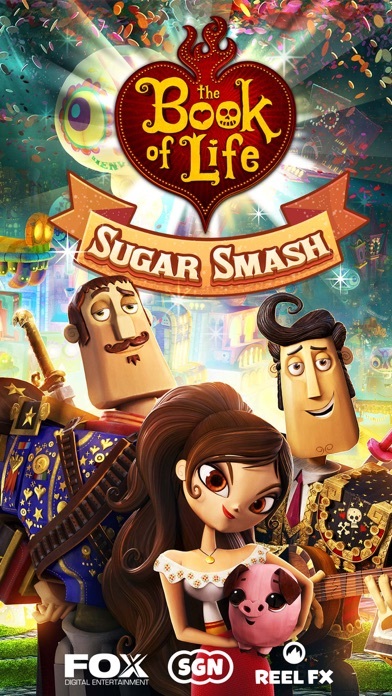 The Book of Life: Sugar Smash is free to play, but you can purchase in-app items with real money. In addition, this game may link to social media services such as Facebook in order for you to share and play with others. Jam City will also have access to your information through such services. Some aspects of this game will require the player to connect to the internet. In-app purchases may be disabled by adjusting your device’s settings. This game is not supported by the iPod Touch 4 and is only supported on the iPhone 4s and up. It takes sooo long to load this game before you can play. It gets annoying. Too many videos to watch so you can get extra plays. Every time you enter into a new area. There should be a prize. Incentive to keep going up the Levels. I would also like to know how my progress compares to others. If you stop playing the game for a couple of days or weeks, when you do try to play again, the game makes it impossible for you to win. It seems like they try punishing you and keep you at stuck on the same level. Been playing for 3 years off and on. Sugar smash is a fun game. But been having a continued issue and is that it’s been freezing too much and been having to start all over again. Losing my powers/gifts obtained. Please fix the bug ty. Love this game! But is 3270 levels all you got? Takes way to long for new levels to come up. I’ve been at the end of the road for a month now. “New levels coming soon” is not to be believed. Like it before but not anymore. If it isn’t improved soon I will be deleting it.